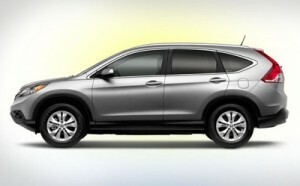 Power, space, and comfort have helped to make the 2013 Honda CR-V crossover SUV one of the most trusted models in its class. The CR-V also continues to be a popular model with Middletown and Mecahnicstown drivers. It comes equipped with Honda’s iMID multimedia suite, delivering features like handsfree calling, music streaming, a rear-view camera, and more. Take the 2013 CR-V out for a test drive at Middletown Honda, a quick drive from Mahwah and Newburgh. Look for us on Route 211, right next to the GanderMountain. Thanks to a dedication to honest, personalized service, we continue to be one of the most trusted places around to shop for vehicles. The 2013 Chevy Equinox, another competitor in the crossover SUV class, doesn’t come as well equipped as the CR-V. It also has less passenger and cargo space. Let’s take a look at how the two models matchup. With a maximum passenger occupancy of 104.1 cubic feet, the 2013 CR-V delivers almost five more cubic feet of interior space than the 2013 Equinox. It also has more than six cubic feet of standard cargo space than the Equinox, room that can be increased by the split 60/40 rear seat. The base CR-V is also available with an exterior rack. Good luck finding one of those on the Equinox. Take the CR-V out for a test drive at Middletown Honda, located just a short drive from Mahwah and Newburgh. Look for us at 520 Route 211, in Middletown. If you have any questions about the CR-V or any of our other current Honda models, feel free contact Middletown Honda.